SEPTA is asking its passengers to help stop hunger in the Philadelphia region. 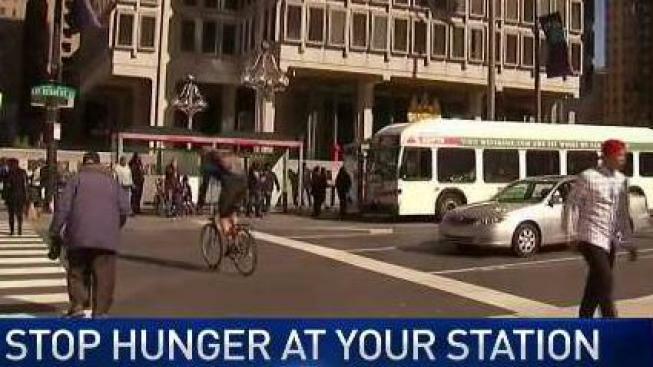 The transit agency announced their 9th annual Stop Hunger at Your Station food drive Tuesday morning. SEPTA teamed up with Philabundance for the food drive, which runs from June 12 to 23 with a focus on eliminating childhood hunger in the Greater Philadelphia region during a rough time of year. "Summertime is especially hard for parents struggling to feed their families," SEPTA General Manager Jeffrey Knueppel said. "During the school year, many children receive free or reduced-cost breakfasts and lunches. In the summer, families must find a way to provide two additional meals for their children every day." Philabundance stresses the extra need for summer food donations to keep children fed. "With 300,000 children in our area facing hunger in the summer when they lose their school meals, we hope the public will participate in SEPTA’s Stop Hunger at Your Station Food Drive to help drive hunger from our communities," Glenn Bergman, Executive Director of Philabundance, said. "Thanks to the generosity of SEPTA, its employees and riders, to date, the cause has raised over 260,000 meals for our neighbors in need." Each transit line will include collection barrels at multiple stops. Visit SEPTA's website to find the drop off site nearest you. The public is also encouraged to make a donation to Philabundance online or via text message. By sending "Food" to 41010 you can provide a $10 donation, all of which will go towards those in need. For every dollar donated, Philabundance can provide two meals to families in the area. Since 2009, the Stop Hunger at Your Station initiative has led to over 264,000 total meals. "This food will be incredibly beneficial for these children and their families at a time where many go to sleep hungry and without knowing where their next meal will come from," Philabundance director of communications Stef Arck-Baynes said. If you know someone who is in need of food assistance, tell them to call 1-866-3-Hungry.